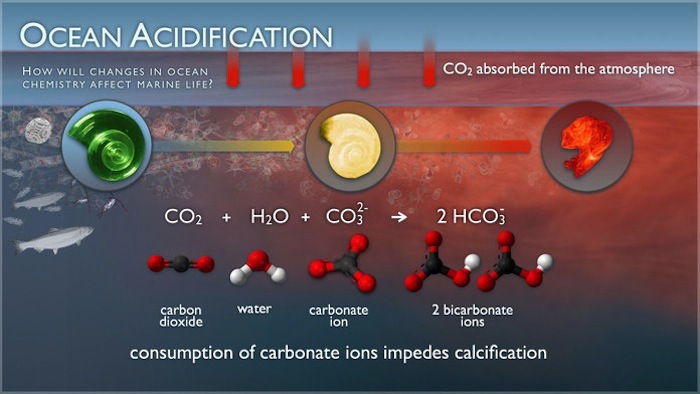 Ocean acidification, also known as "The other CO2 problem," refers to the fundamental changes in the chemistry of the Earth's oceans due to increased carbon dioxide emissions. Since the beginning of the industrial revolution, the release of carbon dioxide into the atmosphere has increased exponentially. The ocean absorbs about half of the CO2 we release into the atmosphere every year, so as atmospheric CO2 levels increase, so do the levels in the ocean - making them more acidic. Our current acidification rates are unparalleled in Earth's history and will lead most ecosystems into unknown territory. The acidity of the planets oceans have risen by 30% since the industrial revolution by absorbing 530 billion tons of CO2, and the current rate of ocean acidification is at least a hundred times faster than any time in the last few hundred thousand years and is most likely unprecedented in the Earth’s history. If we continue on our currents emissions trajectory, by the end of the century the acidity of the planet’s oceans could be more than double what it was prior to the industrial revolution. Coral reefs, bottom-dwelling shellfish and crustaceans, which maintain the basal level of the oceanic food chain, and ocean beds all over the world are literally being eaten away by ocean acidification. If we continue to emit carbon dioxide at the rate we are going, by 2030 we won’t have any coral reefs left aside from rubble and much deeper coral that may survive and the ocean's thousands of species of calcifying organisms, which are creatures that build structures such as shells and skeletons out of calcium carbonate, such as mussels, clams, shrimp, sea stars and sea urchins to smaller, microscopic organisms, such as pteropods and phytoplankton, will be unable to build the very structures they rely upon for their survival. This matters because these tiny creatures form the base of oceanic food webs all over the planet. When these organisms begin disappearing, the fish and other sea life which feed on them suffer, which in turn affects the creatures that feed on them and so on up the predatory chain, all the way to the top of the line to the swordfish, bluefin tuna and king mackerel that are targeted by commercial fishing vessels as man’s favorite prey, and beyond. These disruptions will have widespread ripple effects further depleting already over-exploited fisheries worldwide. According to Oceana, Pakistan, Thailand, the Philippines, Iran, and China are among the top 50 nations whose food security may be threatened by the effects ocean acidification is already starting to have on fish and shellfish. The only way to stop acidification is to emit less carbon dioxide. Learn more. In decades, rising ocean acidity may challenge life on a scale that has not occurred for tens of millions of years. Learn more. Colder water absorbs more CO2 and so the Arctic oceans will be hit hardest by the new chemical composition of the oceans. By mid-century if we continue emitting carbon dioxide the way we have been, entire vast areas of both the Southern Ocean and the Arctic Ocean will be so corrosive that it will cause seashells to dissolve by 2050. Learn more. We can look to the geologic history of the oceans to find out just how devastating ocean acidification can be for the organisms that make up coral reefs for other marine calcifiers. About 55 million years ago, an ecological crisis called the Paleocene-Eocene Thermal Maximum (PETM) occurred. A huge release of carbon into the atmosphere created the oceans, which absorb half of atmospheric CO2, to become significantly more acidic, which resulted in mass extinctions with many calcifying organisms - that form the base of the oceanic food web - dying out. If we continue our current carbon emissions path by burning fossil fuels and cutting down immense areas of forests at the rates we do today, the amount of CO2 the oceans absorb will likely be on a par with the PETM and potentially even more catastrophic because the current rise in emissions is happening at a much faster rate, leaving the creatures no time to adapt. 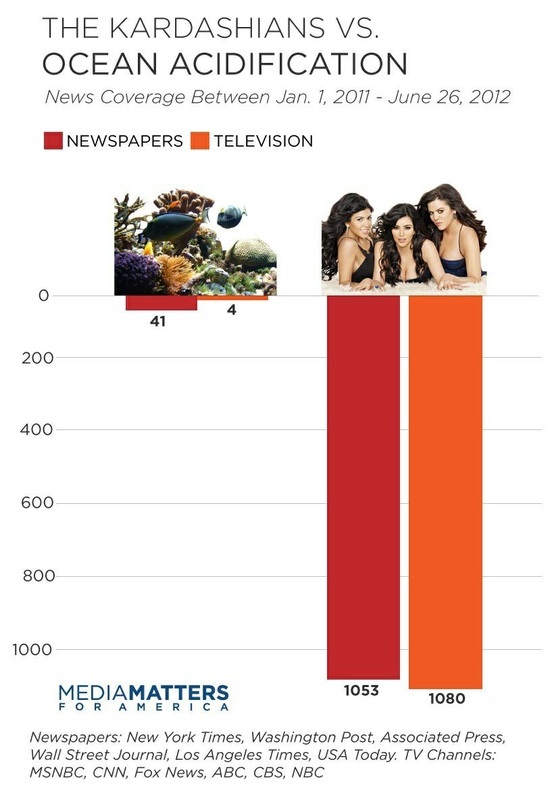 In fact, ocean acidification during the PETM was most likely 10 times slower than current acidification. It took millions of years for the populations of calcifiers to recover from the acidification of the PETM. We simply can’t afford to let these kinds of mass extinctions happen again. Learn more. "The current rate of ocean acidification is about a hundred times faster than the most rapid events in the geologic past." ~William Howard, Antarctic Climate & Ecosystems CRC Learn more. "Unless we curb carbon emissions we risk mass extinctions, degrading coastal waters and encouraging outbreaks of toxic jellyfish and algae. A unique ‘natural laboratory’ in the Mediterranean Sea is revealing the effects of rising carbon dioxide levels on life in the oceans. The results show a bleak future for marine life as ocean acidity rises, and suggest that similar lowering of ocean pH levels may have been responsible for massive extinctions in the past. A tipping point occurs at mean pH 7.8. This is the pH level predicted for the end of this century" ~Geologic Society of London Learn more. The only way to stop acidification is to emit less carbon dioxide.